Henneth Annun, Pt. 1: Faramir questions Frodo and Sam. This is the first of seven, yes, seven entries for the Henneth Annun screencaps. The Henneth Annun screencap entries will be the last for TTT. I will post the book quotes where I think they can fit. This is not as easy as it might be, since the film version of this sequence differs so much from Tolkien, but I will try. With the exception of Pt. 6 ("The Goons of Gondor"), I will try not to dwell on negative things in this series. 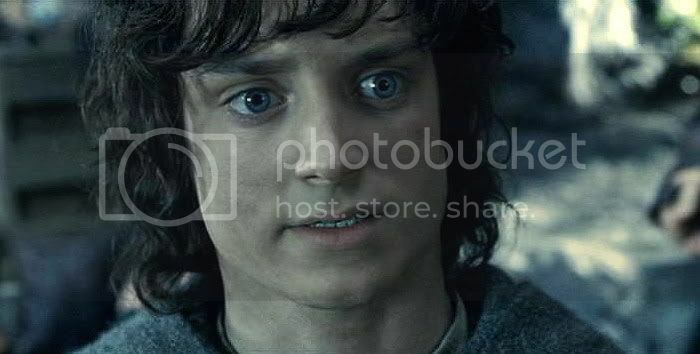 The Henneth Annun sequence has some of the most arresting, most beautiful images of Frodo in all of the trilogy. I think the whole section—both the theatrical and extended versions—works well as film story-telling. It is beautifully shot, well-acted, and makes for engrossing screen drama. I try always to bear in mind that the films are the films and book is the book, but much violence was done to Tolkien's story in this section, with noble characters savaged along with the values and themes their actions embodied. In this first scene, the hobbits, hands bound and blindfolded, are handed into the cave behind the falls. Once inside, their bonds are cut and their eyes uncovered. Rubbing their wrists they stand nervously before Faramir. Most of the lines are taken from the book scene in the forest prior to the ascent to the falls. 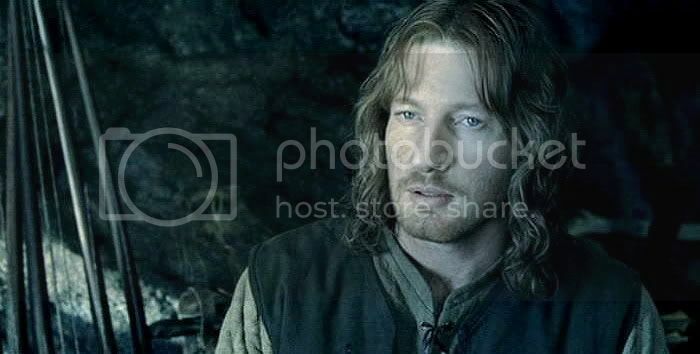 But although many of the words are the same, the character of the scene is altered by the changed behaviour of Faramir. 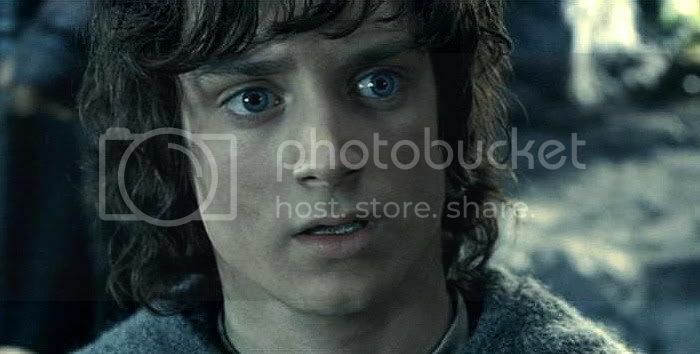 In the book, Frodo is questioned very closely (the questioning taking place in the woods), but is allowed to walk freely with Faramir, talking with him as they go, until they reach the secret path. There Frodo and Sam are apologetically blindfolded. In the film the hobbits are roughly accosted in the woods, bound, and force-marched before being blindfolded and carried into the hideout. No talk, no respectful treatment. In the book, Faramir is a subtle, persuasive interrogator. 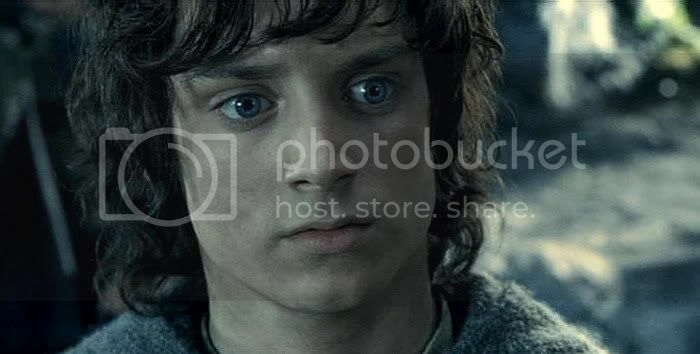 Frodo is hard-pressed to keep the core of his mission secret, both because Faramir is so acute and because his captor is so good at inspiring trust. The interrogation is never physical, nor is violence ever threatened. It is the interrogation of a person of rank by another person of rank. 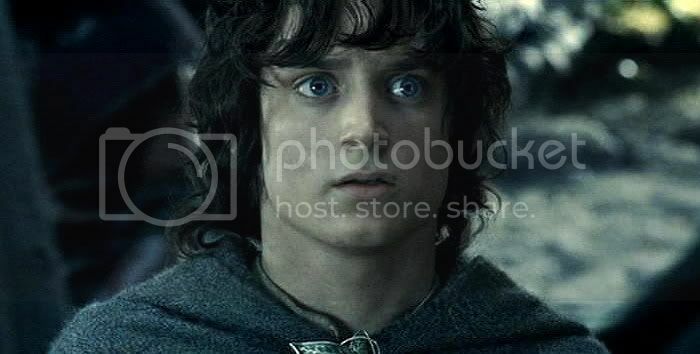 In the film, the frightened hobbits stand before Faramir like miscreants before a case-hardened investigating officer inclined to look at all his suspects with a bit of contempt. This attitude falls away when Faramir begins to hear of his brother. His eyes narrow with suspicion, then rising emotion. He tries to keep up the front of emotional inaccessibility, but his eyes become moist and his voice catches as he says, "He was my brother". The EE flashbacks (Fararmir seeing Boromir drifting by in the boat, and the remembered scene at Osgiliath that shows the brothers' mutual love, but the father's inequitable feelings for the two) flow perfectly from Faramir's heightened feelings. Again, this is an excellent scene dramatically, but it does involve changing the portrayal of Faramir considerably, which necessarily changes the relationship portrayed between him and Frodo. No longer is this tense, wary first meeting between Gondor's finest son and the best Hobbit of the Shire, two virtual princes of their people. In the film scene, Faramir is the harried and troubled special services officer of Gondor, who stumbles fortuitiously upon the one small person who bears, unlooked for, the means to securing the promotion he has long desired. A great scene, but not Tolkien's. Book scene, from Of Herbs and Stewed Rabbit. Faramir and his rangers have captured Frodo and Sam in Ithilien, having seen their cooking fire. Faramir leaves Frodo and Sam under guard while he leads an ambush against the Southrons. It is late afternoon when Faramir comes back. 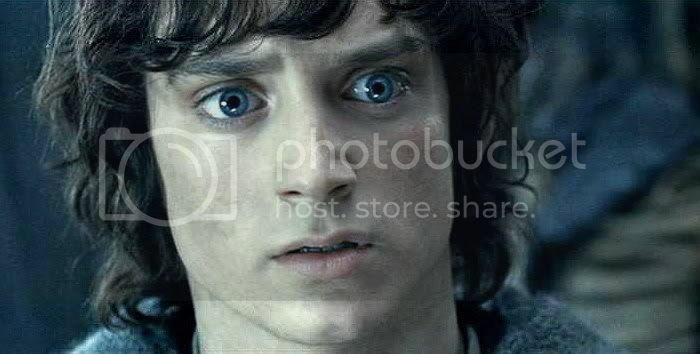 Sam has dozed and wakes to see Frodo is not there. No one notices as Sam creeps out of the fern. 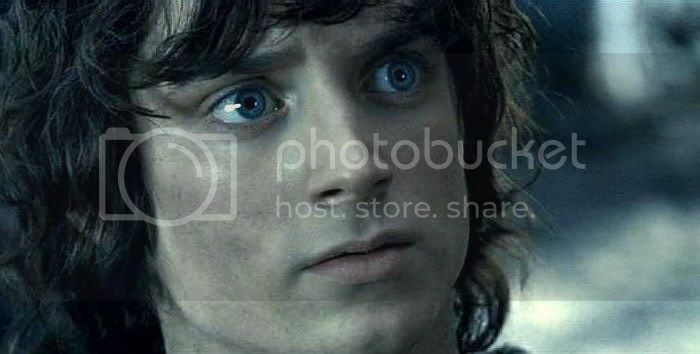 Quietly he watches as Frodo, standing in the middle of a ring of Men like a prisoner on trial, is questioned by Faramir, seated on the ground before him. 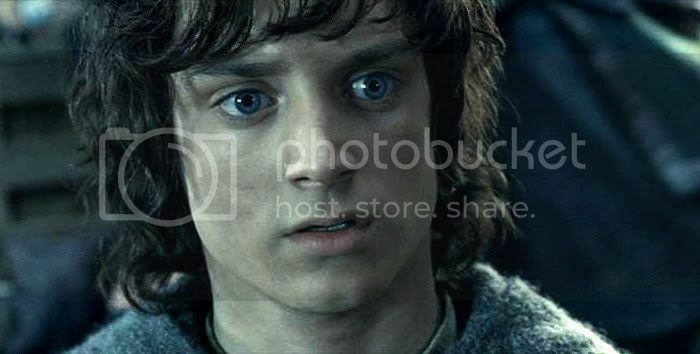 Sam soon became aware that the Captain was not satisfied with Frodo’s account of himself at several points…. In particular he returned often to Isildur’s Bane. 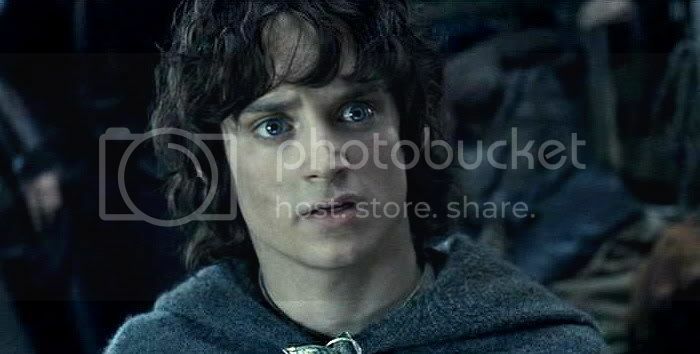 Plainly he saw that Frodo was concealing from him some matter of great importance. Faramir presses Frodo further, asking why Boromir was not leader of the Company. 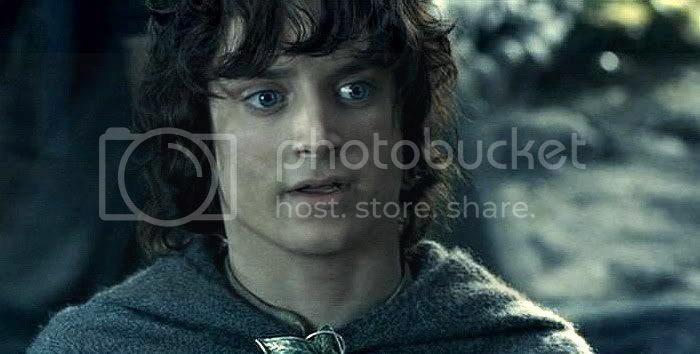 Frodo tells of Aragorn and the sword of Elendil. ‘So!’ he said. ‘You bid me mind my own affairs, and get me back home, and let you be. Boromir will tell all, when he comes. When he comes, say you! Were you a friend of Boromir? Sam sat down heavily with a red face. Faramir turned to Frodo again. ‘You asked how do I know that the son of Denethor is dead. Tidings of death have many wings. Night oft brings news to near kindred, t’is said. Boromir was my brother. Film Scene: (lines from EE scene in green) "He was my brother." Faramir: Well if you’re not spies, then who are you? Speak! Frodo: There was no other. We set out from Rivendell with seven companions. One we lost in Moria. Two were my kin. A dwarf there was also. And an Elf. And two Men. Aragorn, son of Arathorn, and Boromir of Gondor. Faramir: You were a friend of Boromir? Faramir: It will grieve you then to learn that he is dead? Faramir: As one of his companions, I had hoped you would tell me. 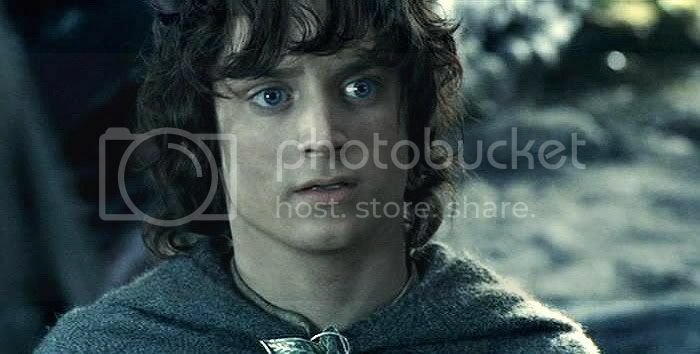 Frodo: If something has happened to Boromir we would have you tell us. Faramir: His horn washed up upon the riverbank, about six days past. It was cloven in two. But more than this I know it in my heart. He was my brother. The EE continues with the two [excellent] flashbacks. What an exquisite phrase, Mechtild. Thanks, Mews. Yes, he's just beautiful in this whole sequence of scenes. Every new lighting makes him look gorgeous, but in different ways. Frodo and Sam did beautifully in this. 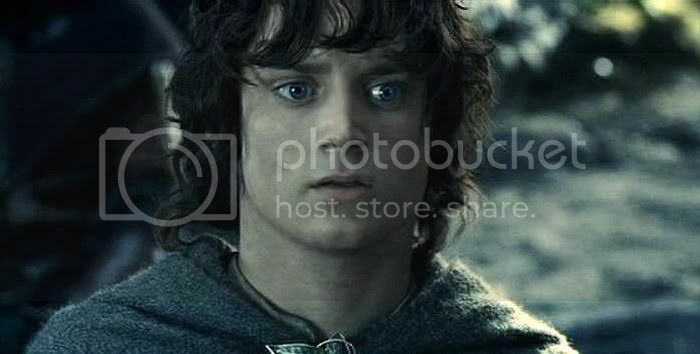 I loved the way the exchange turned out, original to the film, when Faramir asks with quiet cockiness, is Sam Frodo's body guard? Sam's reply is so perfectly delivered: No, his gardener. HAW! oh my. 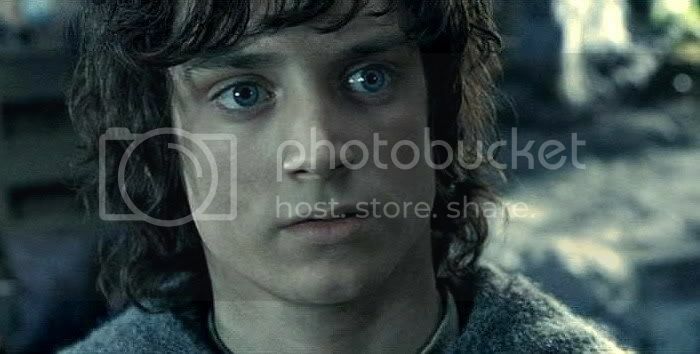 Frodo getting interrogated just takes my breath away. He's so beautiful. And I really just always regretted them not meeting under better circumstances because they could be such good friends, so equal they are in so many ways! Well, they'll have to wait to be good friends until RotK, in which Faramir is restored to something like his book self and his friend-able. With your lovely analysis of how this scene differs from that in Tolkien, and how we can reconcile ourselves with it anyway, I think you've redeemed it for me. Thanks for commenting, Ruby. I can't reconcile myself to *everything*, as you'll see in Pt. 6, but if I stick to the theatrical version of this sequence, I am very, very happy with it as film. 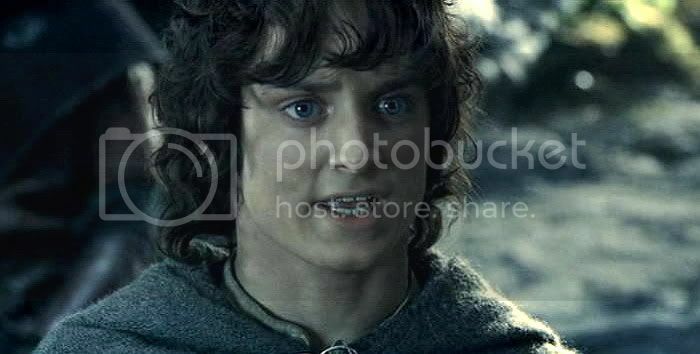 I love the takes of Frodo in these scenes but I think the change of Faramir's character is one of the main reasons why I like TTT the least of all movies. Of course, the movies are the movies, and the books are the books, but I loved book Faramir - his treatment of the hobbits and the way he gains their trust in the end. Two princes indeed! And then this last scene when Sam's bed is put beside Frodo's and Sam tells him that he has "shown his quality" always has me in tears. The line is in the EE but for me it doesn't work anymore. The screen caps are so gorgeous, Mechling! I could stare at them all day. It is beyond my ability to choose a favourite but that last one is beyond beautiful. Reading the excerpts from the book gave me goose-bumps. Iirc one of the few things The One Ring had to work on, at the Sammath Naur, was pride. This is the first time I have actually noticed it mentioned in the book. Thank you for adding to my enjoyment of both book and films. 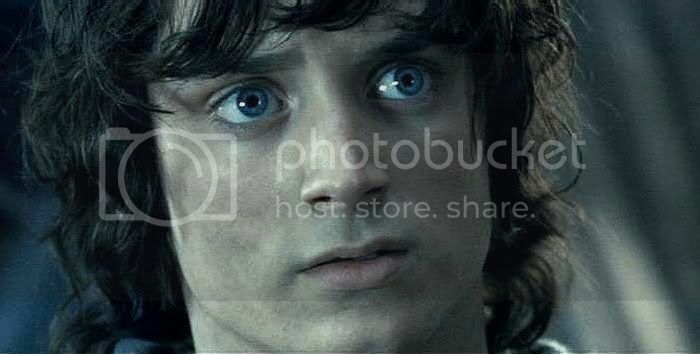 Yes, Frodo has pride, as does Pippin in the book when he is ashamed by Denethor's treatment of him, his obvious contempt for his abilities after he tells how Boromir died saving them. It's Pippin's pride that makes him step forward and offer his service. But Gandalf in the book tells Pippin that was well-done. I think there's such things as good and bad pride in the book's world. Bad pride leads people to vanity and despair or showiness that results in loss of life and defeat. But good pride urges people to do the right thing, so that they won't be ashamed of themselves. Thanks so much for your acute thoughts, Este. No longer is this tense, wary first meeting between Gondor's finest son and the best Hobbit of the Shire, two virtual princes of their people. In the film scene, Faramir is the harried and troubled special services officer of Gondor, who stumbles fortuitiously upon the one small person who bears, unlooked for, the means to securing the promotion he has long desired. A great scene, but not Tolkien's. I adore all three of them in the scene which Tolkien wrote: Captain Gorgeous I mean Faramir is so wise and astute and canny (swoon); noble Frodo more than proves himself to be Captain Gorgeous I mean Faramir's equal (double swoon) ... and I simply ADORE Sam!! And I just love how Faramir handles Sam too. And I love how he handles Frodo. And how Frodo handles him. Ah, Tolkien's scene.... What characters! And so well-depicted! I really do love David Wenham in the role, but his Faramir doesn't seem to recover until Return of the King, at which time he recovers from his multiple personality disorder and becomes the faithful, capable, gentle-humoured man who is more familiar to us. He still doesn't have book Faramir's aura of wisdom (so that Sam is reminded of wizards), but he does have honour, a certain soulfulness, and nobility of character. 7 entries !!! Wow, I admire you, dear. What an opening.Your report is excellent, it's one of those scenes I like in the books (Tolkien's characters are great) AND in the movie (Jackson's characters are wonderful, different (especially Faramir), but wonderful. "No longer is this tense, wary first meeting between Gondor's finest son and the best Hobbit of the Shire, two virtual princes of their people. 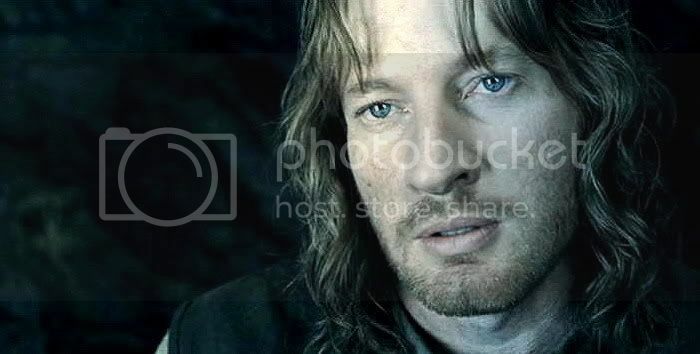 In the film scene, Faramir is the harried and troubled special services officer of Gondor, who stumbles fortuitiously upon the one small person who bears, unlooked for, the means to securing the promotion he has long desired. A great scene, but not Tolkien's." A wonderful scene, no doubt, not Tolkien's but it works very well for me. The caps! Oh my god - he always looks gorgeous, but here it's this special aura around him. He makes me hold my breath all along. If there would be stars here the stars themselves would sparkle around him. I'm sitting here, translation comes first, then reading, not to forget staring,most important thinking about your post. Commenting. I never read the comments of your friends before I commented, reading the comments then ... wow... priceless. Everyone seems just a little happier with your wonderful works, my dear. The next 6 nights , oh I can't wait to return back and read your second post. Another time you made my night, mechtild. I'm sitting here, translation comes first, then reading, not to forget staring, most important thinking about your post. Commenting. There! You did all the main things, Julchen, only for you is the added burden of translating. But if anything must stay it is the staring. 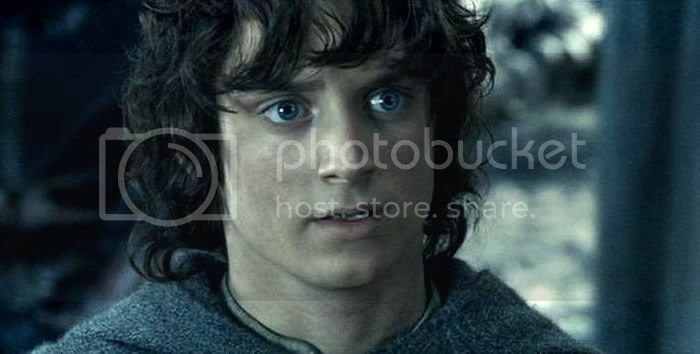 Frodo in Henneth Annun is definitely worth staring at! Thanks so much for commenting, Julchen. You are such an attentive visitor to this series. I really appreciate it.